Engadget Daily: Facebook's emotional experiment, social media activism and more! 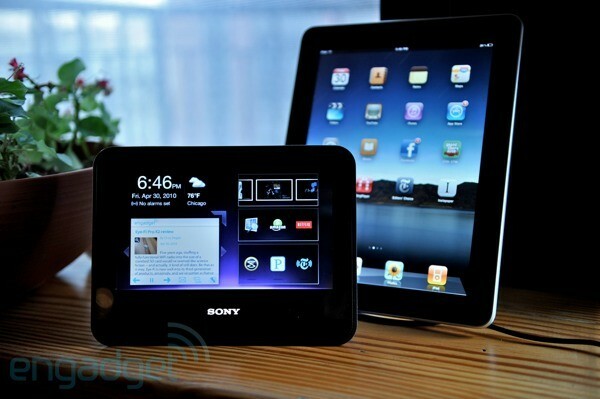 When we first saw the Sony Dash at CES, we thought Sony was making a play into the tablet game -- the promo video showed people using the angular device all over the house, with nary a power cord in sight. And hey, it was called the Dash -- a word which usually implies movement of some kind. So obviously we were a little put off when we found out the Dash was strictly a stationary experience -- an amped-up alarm clock running a Sony-tweaked version of the Chumby widget OS that lets you look at photos from Facebook, browse headlines on Engadget, and check Twitter from the Dash's seven-inch capacitive touchscreen. But hold up: the Dash also adds in Sony's Bravia Internet Video platform to support streaming media services like Netflix, Pandora, and Slacker. That's not bad for $200, at least on paper, but does the Dash deserve to be the most expensive alarm clock you've ever purchased? And does it really deserve Justin Bieber's attention? Read on to find out. How would you rate the Dash HID-C10? Hardware-wise, the Dash is pretty straightforward: there's a seven-inch capacitive touchscreen and stereo speakers on the front, a snooze bar / menu button and volume buttons on the top, a USB port and headphone jack under a chunky flap on the left, and a power connection tucked into a recess on the bottom. Most of the wedge-shaped case is covered with a you-tell-us-if-it's-attractive grippy rubber material, which means you don't worry about dropping it when you pick it up. Of course, since the Dash doesn't have a battery and needs to stay plugged in, you're not really supposed to pick it up a lot -- we always felt sort of nervous when we scooped it up to play with it. It looks like Justin Bieber agrees with us -- isn't this totally casual pose exactly how we all want to look when we're doing some light media consumption? Sony tells us it's going to put a battery into the next version of the Dash, which is great -- we think it's a must-have feature addition. Internally, we're told the Dash has a 500MHz processor and 256MB of RAM, compared to the 454MHz chip and 64MB of RAM in the Chumby One and 350MHz chip in the Chumby. We're guessing the extra horsepower goes towards supporting video playback and the larger 800 x 480 display, but the Dash isn't a rocket by any means -- the capacitive touchscreen seems responsive enough, but the OS was laggy enough to drive us bonkers. The display itself is nice and bright with great horizontal viewing angles and average vertical angles -- three or so people can easily share the device at once. You can also flip the Dash over on its back to engage the built-in accelerometer and rotate the display 180 degrees, which is handy if you're using it on a counter. Unfortunately, it's much harder to praise the stereo speakers mounted below the screen -- they're pretty tinny, and they distort at louder volumes if you play any bass-heavy music. That's really it, hardware-wise -- as with all large touchscreen devices, it's the software that makes or breaks the experience with the Dash. The Dash runs Linux, and most of the widgets run inside a Chumby OS layer, which also currently ships on the $119 Chumby One and $149 Chumby Classic. 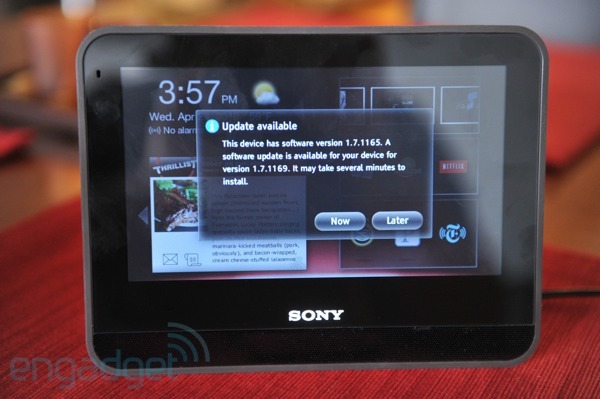 Sony's done some extensive tweaking to the system, mostly to take advantage of the larger display with more info-rich homescreens and a streaming media player, but apart from that, this is the same Chumby Engine you know and... probably don't know, actually. Let's start over: the Dash runs Chumby OS on top of a custom Linux build. Chumby OS is basically a Flash runtime, and Chumby widgets -- Sony calls them Dash Apps -- are little Flash modules that pull data from the cloud. These are the same widgets that owners of the old plush Chumby and the Chumby One are already well-acquainted with -- they're optimized for "glanceable" information. In addition to the Chumby stuff, Sony's added its robust (and exclusive) Bravia Internet Video streaming media layer, which enables apps from Netflix, Pandora, Slacker, Amazon Video On Demand, YouTube and a host of other providers. 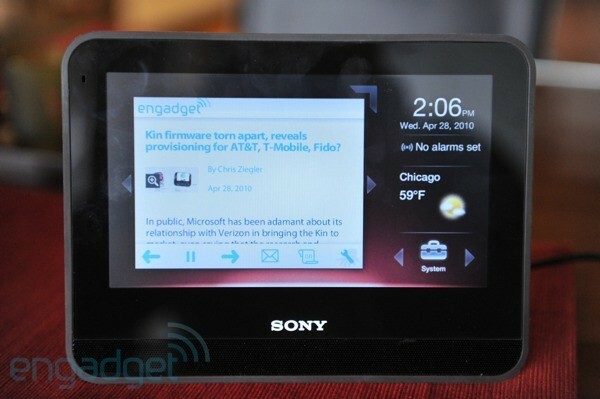 Yep, it's a big Flash-based alarm clock that can run widgets in the background -- bet you never saw that coming. Upon first booting the Dash, you're prompted to join your WiFi network and download any software updates if needed. From then on, all the action takes place on the homescreen. 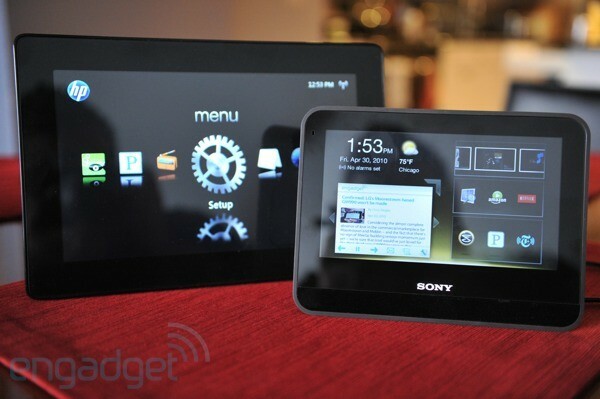 Sony actually ships two different Dash homescreens: there's a "Dashboard" theme that lists your widgets in semi-flickable horizontal lists, and a more widget-focused "App View" that enlarges the Chumby box and only displays the time, weather, and an app category selector -- tapping a category like "Music" brings up a popover list of apps like Slacker and Pandora. We went back and forth between the themes -- switching isn't hard but takes long enough to prevent you from doing it often. We eventually settled on the App View but we found reasons to like the Dashboard as well -- unfortunately, we kept accidentally launching apps when we meant to flick-scroll them in Dashboard view, and that was enough to make us switch for good. Netflix: Well, it's Netflix, on a seven-inch screen. All of the Sony-provided media apps use a similar grid-based interface, which isn't the speediest to update when scrolling, but we'll take what we can get. There's no queue management here, so you'll have to add flicks on your computer, but one you start playing a movie things look fine enough -- HD streaming is supported, but the screen is small enough so that we didn't really notice a difference between SD and HD -- we might have convinced ourselves that The Big Lebowski looked better in HD than Bedtime Stories in SD, but we don't lie to ourselves like that anymore. Amazon: Just as on the TiVo or Roku Video Player, the Amazon and Netflix interfaces on the Dash are extremely similar. Pricing is the usual Amazon pricing: HD rentals are $4.99 for 48 hours, while SD rentals are $3.99. We'd obviously save the extra buck, since the quality difference is so slight on this display, but we're also sort of wondering why you'd pay to rent a movie on the Dash at all -- are you going to watch it lying bed staring at the nightstand? The Amazon app also seemed a little buggy -- it dropped us to its main page several times when we tried to select things. It's nice that it's there, but we'll stick with renting movies on our real TVs. YouTube: The Dash's YouTube playback is fine -- it's actually quite well-suited to the screen size. But like most non-computer and non-smartphone YouTube experiences, it's hampered by a terrible search interface, with a slow touchscreen keyboard and glacial scrolling through lists. By the time you get to what you wanted, you could have watched it twice on a laptop or a phone. That's just sort of a universal YouTube truth, so don't take it as a knock on the Dash too specifically, although a better keyboard and some faster flick scrolling would have really helped out here. Blue Octy Radio: We actually love this one -- it's by far the simplest app on the Dash, and it requires the least amount of interaction with the slow touchscreen. Open it up, pick a station -- like, say, our own Trent Wolbe's WFMU -- and hit play. It's almost like... a radio! Imagine that. Slacker: Slacker and Pandora make a ton of sense on the Dash, and while the Slacker files-and-folders interface isn't the most beautiful thing we've ever seen, it works, and once you're in the player screen it's the same interface as all the other media apps. Pandora: Setting up Pandora on the Dash is a bit of a pain. You can't just log into the service on the device -- you have to activate it through the Sony My Dash website. Once it works, it's Pandora. Facebook: Facebook is actually supported by two stock Chumby widgets, one for status updates and one for photos. They do what they say on the tin, although they require you to set them up online, which is a pain. Of course, given the annoyingly slow touch keyboard, that might be a good thing, but we'd have preferred a centralized experience. Twitter: It's Twitter. Not the fastest Twitter app we've ever seen, and typing out this tweet took 10 minutes because we misspelled a word and the lack of a cursor meant we had to delete half of it and start over on the lame keyboard, but it'll certainly do in a pinch. You know, if you're ever in bed or in your kitchen, next to a plug outlet, without your phone or laptop. We've all been there, right? Sony calls the Dash a "personal internet viewer," and cloud-based content is the clear priority: there's no provision for streaming your own media from a computer or server. That's a bit of a bummer, especially since the USB port isn't supported for local playback of music or photos yet. There are a couple Chumby widgets that seem to handle LAN streaming, however -- we didn't try them, but at least they're there. Same goes for photos: it's easier to look at Facebook photos than it is to view images from your PC, and while there are Chumby widgets that bridge the gap, we wish Sony had included some built-in functionality for that. There are tons of other Chumby widgets -- over 1,000, we're told -- so the Dash can be extended in any number of ways beyond the apps we've listed. But those are the core apps, and while they're pretty good, we almost always found ourselves wondering why we'd be doing some of this stuff on the Dash instead of a phone or a laptop. It's a question that invites immediate comparison to two very different devices -- the HP DreamScreen and the iPad. We'll be frank: the Dash blows the DreamScreen out of the water. The DreamScreen is essentially the same concept with a bigger display: a lightweight connected photo frame with a handful of widgets that pull down glanceable data. Interacting with the DreamScreen is painfully slow and annoying, however -- it's best when you set it up and leave it alone to display the weather or photos or whatever. In that context, the Dash has richer apps and widgets, it's much more pleasant to use, and hey -- it's $50 cheaper. If you're looking for a smart photo frame or a really kickass alarm clock, the Dash is a no-brainer. Every time we left the Dash sitting around, we loved it and thought of it as being better than the DreamScreen, but every time we picked it up and used it more intensely, we wished we'd reached for a phone, laptop, or the iPad instead. We probably could have saved everyone a lot of time by just putting that up top, right? So, should you buy the world's most complicated alarm clock? It all depends on what you want to do with the Dash. If you're looking for something that can sit by your bed, play some internet radio at you, and ambiently display some Engadget headlines and photos from Facebook, the Dash is perfect. If you're looking for something to really pick up and use to browse through photos, or pick songs, or even watch movies, we'd go a different way. Despite its name, the Dash is too stationary and too slow to be valuable in those situations. All that said, our verdict might change dramatically if the Dash 2 has a faster processor, that promised battery, and a slick-looking charging dock, especially if the price stays at $199. We'd love to love this thing, Sony -- let's make it happen.